WOW! WOW! WOW! That is all that I can say. Well, I can say a lot more but I won't. This has been a very long and hard road. 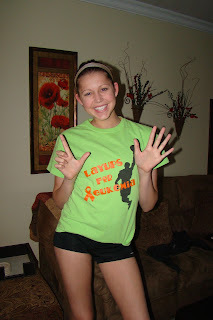 We have come 1,097 days out of our 1,104 days of treatment. We are down to SEVEN days left. It feels so surreal. I am going through her apothecary draw, her medicine draw, filling her pill box and I realize that I am at the end, the box is empty for the last two weeks of this month, I keep picking it up, wanting to fill it thinking that I have forgotten to do this. As I look back, I have seen tremendous growth in Elizabeth, our family, and her friends. What a gift God has given to all of us in that respect. Even as I say this, I find myself feeling very weak and frightened to take her off of her chemo. The chemo is the agent fighting the monster that invaded her body two and a half years ago, without her having the chemo, I feel like I am free falling. I need prayers for strength not to borrow worries from tomorrow. All I can do is continue to pray to our Father that he keeps Elizabeth in remission; that this cancer never rears its ugly head again. Knowing that there is not a cure is a frightening reality for a parent to face. I can only pray and drop my worries at the foot of the cross. Thank you to everyone that has shared in our journey. We could not have made it through the past few years without your prayers, help, and great show of love and support. Please, NEVER stop praying for Liz and those suffering with cancer. If you want to be a hero to someone ...... go and donate blood or platelets this week! Best of luck to Liz from here on out. I pray for her, Joel and every kid dealing with cancer every night. I know that just by knowing your family and Joel's family that I have grown tremendously and now know just how important something as donating blood or platelets really is. WOW - humbled by being a witness of this process and a prayer partner. We won't stop praying for all of you. Christine you are such an amazing person your family is an inspiration to all. I will keep Lizzy and your family in my prayers. We'll keep praying for Liz and Joel! We love you guys. And now that's been year since I was in the Belizian jungle, I can finally give blood again! You are an amazing inspiration to all of us. Such strength, such faith! Well done and in good form I must say. So happy for all of you!!! Wishing you many happy days ahead. Think of you all often. I knew she was close!!! I'm SO happy for you both! I know this is a journey for both of you! Love you and can't wait to celebrate no more chemo!!! I remember when I found out and am blessed to have been a part of your lives during this time. Now lets celebrate! When is the party?? Amazing, such an inspiration to all, a true hero. Whoo! So close! It seems like so long ago that I got that call from Catherine, but kind of like yesterday too. I'm so glad for you guys that it's almost over. Wow Christine, what an amazing feeling I'm sure. Have been praying for Lizzy through all of this. I am so happy for you all!!! I will continue to pray. Continued prayers and love to you cuz! Mason Holy Cow...it seemed like this day would never come! So much to celebrate. I'm sooooo happy for you guys! I am so happy for you and your family. Will continue to keep you all in my prayers!!! That is great! Sending love your way! So glad this part of the journey is coming to an end. So happy to hear the good news!!!!!!!! So happy for Liz! She is an insperation to all. Prayers for your family and others facing this. Congrats Lizzy! YAY!!!!! So we are going to celebrate right??? LOVE you all!! !